I first noticed PS:1 because of the sign on the door – the, “Yes we have a Tardis” message. 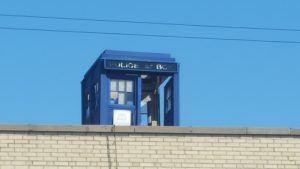 I was intrigued enough to cross the street, look up and see, yep, there’s a Tardis up there. 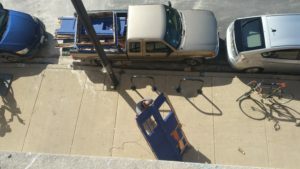 A freaking Tardis! ‘Clearly, this is the place for me,’ I thought. Fast forward several years. 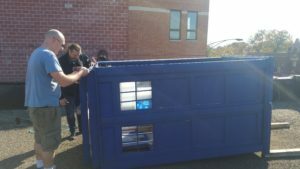 PS:1 has changed and grown, getting bigger and better, but sadly, the Tardis, has not weathered (pun intended) the years well. I have been on the roof several times over the years. 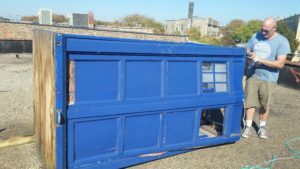 Each time I stopped to take a look at the Tardis, noting that maybe with some TLC, it could be restored to its former glory as a beacon for folks who wanted to find a place to be whimsical, playful, and creative. Over the past year particularly, it became extremely obvious that it was suffering real damage, and if there was going to be any chance of saving it, the time had come to try. At best, I figured we could disassemble and rebuild it, and even possibly use it to hide the new dust collector. 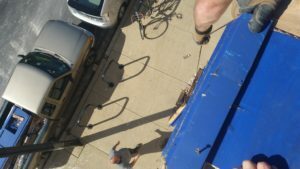 Upon investigation, we determined that the wood was rotted through, and that it was a real hazard to everyone and everything on Elston Ave. below. A bad storm would likely have ripped off large chunks, sending them flying straight into a law suit. So Ken, Andy, and I, with assistance from Kyle who happened to have a pickup truck with an empty bed, the disassembly and lowered the pieces to the street below. Most were lowered by some rope Andy just happened to have; some pieces we simply chucked overboard (always timed so nobody was anywhere near PS:1). Given how heavy some of the parts were, I’m quite impressed with the folks who got it up there in the first place! 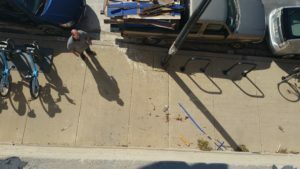 After the large pieces came down, Kyle sent up some garbage bags and we cleaned up the rest, leaving little to indicate that anything had ever been up there. 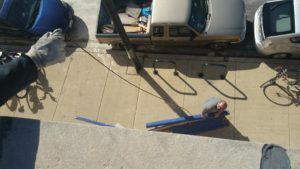 Mike Skilton was on hand to help unload Kyle’s truck and cut the chunks down to dumpster size. As I write this, a fair number of the pieces are sitting on a pallet on the loading dock, waiting for the dumpster to be emptied so they can be thrown away. The Tardis has been around since very early days. It can be seen on PS:1’s Flickr pool going back to the original space. The Tardis is an emblem of the spirit of the space, and demonstrates what can be done by a group of individuals with a common purpose: to make something awesome that makes others happy. Personally, I think of PS:1 not as a collection of tools and equipment, but of interesting people who want to make and do interesting things – and who can and do come together from time to time to make PS:1 itself better. PS:1 is the place it is because of people helping each other. To anyone who has installed something, volunteered for a committee, fixed equipment, or shared an idea to make the place better for everyone, I say this: you have made PS:1 more than just a random collection of tools. You have made it a community. I propose that it is time for the community to come together once again to build Tardis 2.0. I whipped up a rough design that would use a steel skeleton clad in weatherproof paneling. In addition to having its windows lit up, it could enclose a weather station and even a webcam. I believe the PS:1 folks can bring their skills to replace the empty space on the roof with a better, more durable Tardis that will continue to elicit smiles and curiosity from passers-by (I can think of three separate times when people have shown up for the open house because they wanted to know what PS:1 was solely because they saw the Tardis on the roof) and hopefully will see it like I did: as an sign that this small beige building is a great community and space for people to have fun and be creative.